Bound up in this study of Alfred Rosenberg (1893-1946), whose influence on Nazi policy was constant until a late-in-the-game falling-out with Hitler, is a tale of how his diary wound up in the United States, now in the holdings of the Holocaust Museum in Washington, D.C. That tale involves a Jewish lawyer who, ousted from his post in the German government by Hermann Göring, ended up in the U.S. advising the FBI and eventually returning to Germany to work for the prosecution at the Nuremberg trials. Robert Kempner (1899-1993) was no less diligent an archivist than the Nazi regime he detested, and, write former FBI investigator Wittman (Priceless: How I Went Undercover to Rescue the World’s Stolen Treasures, 2010) and journalist Kinney (The Dylanologists, 2014, etc. ), he “spent four years immersed in the documentary evidence of the Nazi crimes.” Moreover, brilliant as a researcher and litigator while also a first-class hoarder, he squirrelled away some of that documentary evidence in his own archives, including Rosenberg’s diary. The picture that long-missing diary affords of those Nazi crimes does not remake our understanding, but it certainly adds to it. When Rosenberg grimly writes, “some still haven’t yet understood…that things have to be calculated differently now,” he is signaling the onset of the extermination of Europe’s Jews. 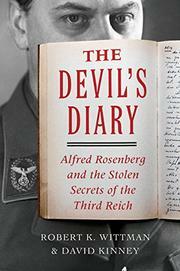 The two narrative threads—one tracking Rosenberg across two decades of Nazi activism and the other examining the fortunes of his diary—don’t always line up neatly, and the storyline sometimes has a stop-and-go quality. However, the authors do an excellent job of teasing out the fine details and placing them in the larger context, in the bargain offering overdue acknowledgment of Kempner’s many contributions to the short-lived effort to bring Nazis to judgment. A footnote to a much larger story but a welcome one.